I am an artist at work today. I'm squeezing this post in before Blogger starts maintenance this evening and believe it or not I have a couple of other projects in progress to be posted later tonight. Raise The Bar Challenge #40-Get A Hobby! 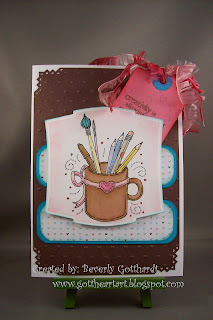 Supplies: White Card Blank 5 1/4" X 7 1/4" The Paper Company, Papers: Stampin Up-Chocolate Chip, Tempting Turquoise, Regal Rose, Whisper White, American Crafts-sm.heart designer paper, Stamps: Digi image-Meljen's Designs, Stampin Up-Sprinkles, Tim Holtz Collection-City Central, Inks: Stampin Up-Chocolate Chip, Bermuda Bay, Regal Rose, Copic Markers, Spellbinders Nestabilities-Labels Two, Cuttlebug cut & emboss folder-Love Language, Marvy sm circle punch, EK Success sm. corner rounder punch, Stampin Up-Pinking Hearts corner punch, $ Store fibers, reg. hole punch, pop dots. Love your image it is awesome! The little details in the corners and the embossing folder just add to the wow factor of your card. THanks for sharing this with us at PPC! Hehehe - an actual hobby card! (I've been seeing a lot of sport cards) Thanks for sharing such a cute card with us and playing along with Raise the Bar last week.